Mistletoe Cottage07469 777915work Self-cateringNestled deep in the Herefordshire countryside, Mistletoe Cottage is a brand new cottage, well appointed and designed to be welcoming and comfortable. There are two king-size bedrooms, one with an en-suite bathroom and the other with and en-suite shower room, utility space, and very well equipped kitchen with everything you need, and some things you don’t! The large dining table is suitable for a light and airy breakfast, or with different lighting is great for a cosy evening in. Plenty of walks and places to visit, and if you just want to relax with a drink and a snack, the garden and front of the house catches the evening sunshine. Not far from Weobley, Mistletoe Cottage is located in the centre of the triangle which joins Hereford, Hay-on-Wye and Leominster – very convenient for the west of the county. Loads to do, for all ages, not least enjoying the beautiful countryside and the bars, restaurants and attractions all within 15-20 miles from the cottage. If you don’t fancy going out for the day, relax with a book and a drink in our delightfully quiet garden, or in front of the house, as you enjoy this natural area of England. 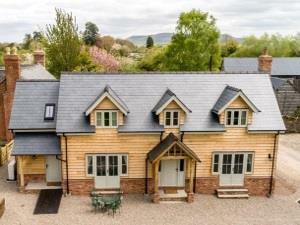 Nestled deep in the Herefordshire countryside, Mistletoe Cottage is a brand new cottage, well appointed and designed to be welcoming and comfortable. There are two king-size bedrooms, one with an en-suite bathroom and the other with and en-suite shower room, utility space, and very well equipped kitchen with everything you need, and some things you don’t! Kinnersley is just off the main road from Brecon to Leominster, the A44. See website for full details.